Ponca State Park, Dixon County, Nebraska A Great Spangled Fritillary finds nourishment on a purple coneflower in Ponca State Park. Found in the United States and Canada, this large butterfly has a wing span of 2-1/2 to 4 inches. The upperside of their wings are orange-brown in color with a black pattern of lines and spots. On the underside, the forewing also features a black pattern of lines and spots. However, on the hindwing, rather than black, there is a beautiful metallic silver pattern. Great Spangled Fritillary can be found in open, moist places including fields, valleys, pastures, meadows, open woodland, and prairies. 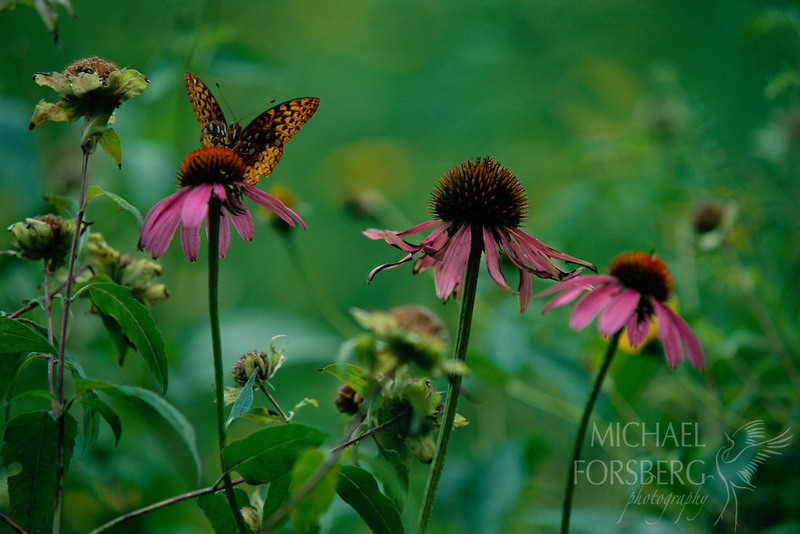 They feed on nectar from many species of flowers including milkweed, thistle, and purple coneflower.